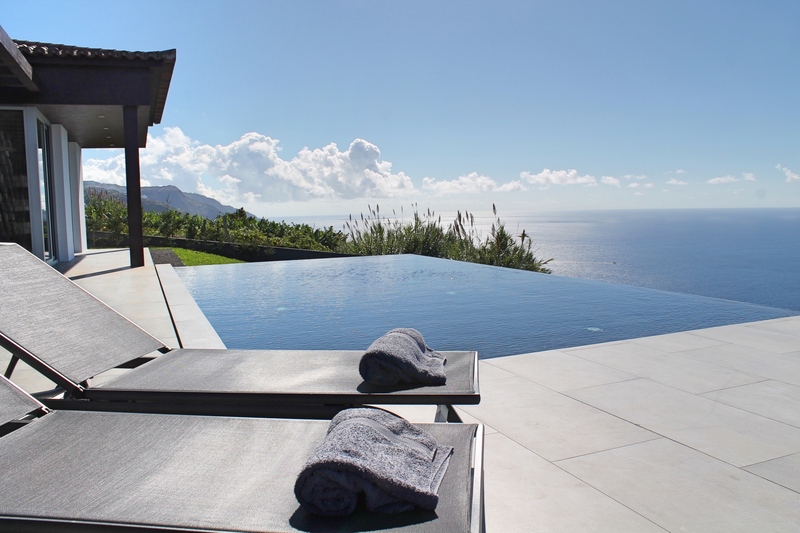 The best of all worlds: superb panoramic sea-views, privacy and tranquility. 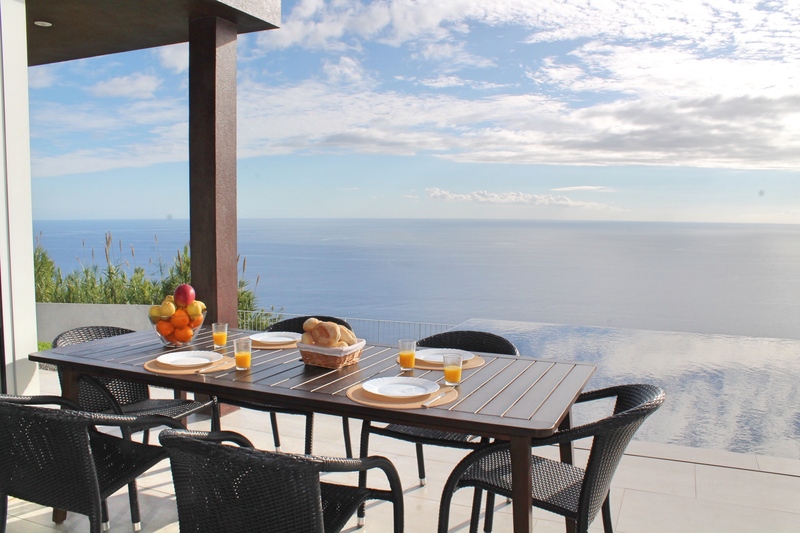 With outstanding panoramic sea-views and offering privacy and seclusion, surrounded by tranquil countryside, Cliffscape is a superb quality air-conditioned villa with heated pool that fully lives up to its name, with the great advantage that it is located in the sunniest area of Madeira and only 300m from the nearest facilities. 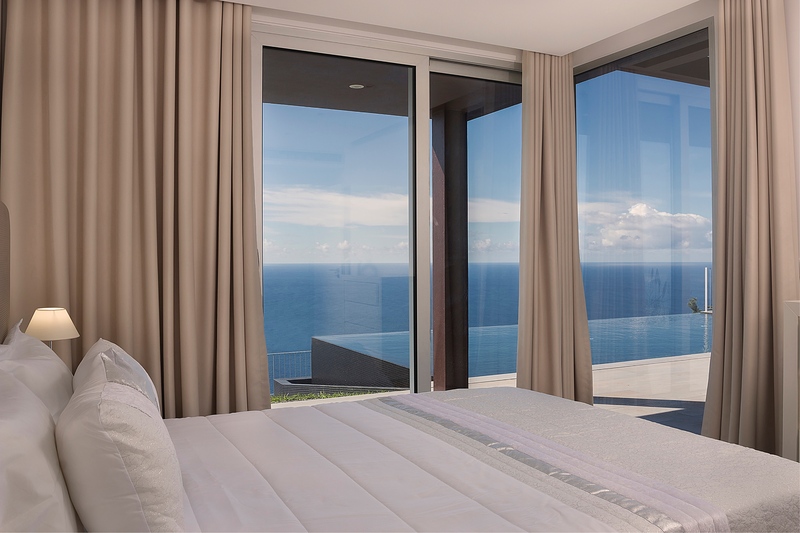 Located at the end of its own driveway and perched on the cliff top, this contemporary villa is designed to embrace the superb views. 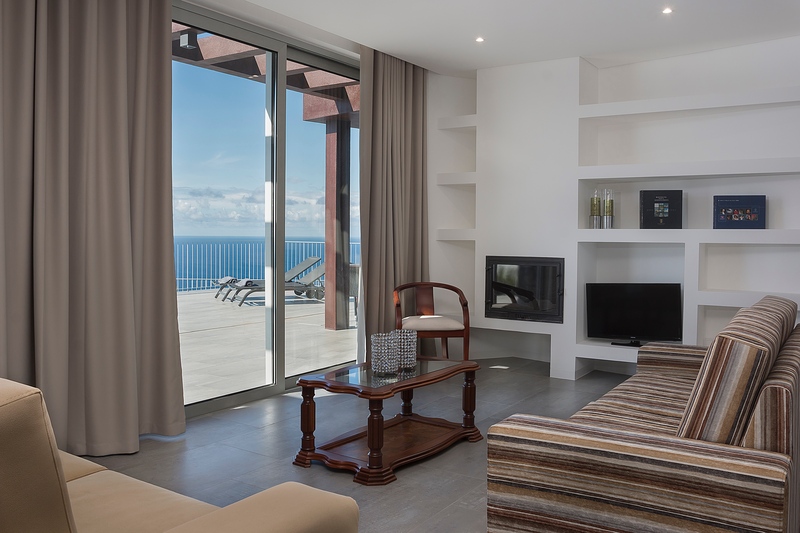 A central living area comprising open-plan sitting area, dining area and kitchen, leading via the large patio doors to the solarium and pool, is flanked by bedroom wings to each side, ensuring those great sea-views are enjoyed everywhere. 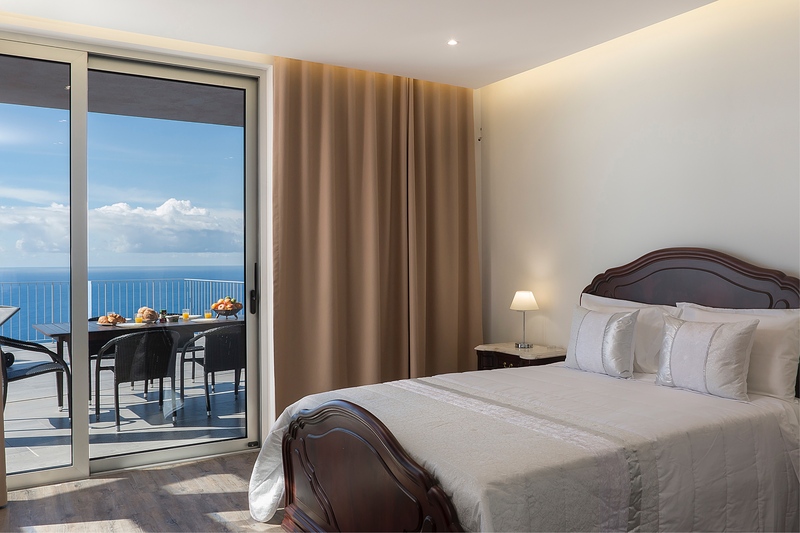 The spacious and bright air-conditioned sitting and dining areas have direct views over the solarium and pool and out to the sea, and are where you will find the flat-screen TV with cable connection, DVD player (with a small selection to watch) and a PlayStation 4 (with a couple of games). In the east wing is a bedroom with single beds and en-suite shower room and a second bedroom with a double bed and a shower room across the hall. The more spacious master bedroom with a double bed and en-suite shower room is in the west wing. 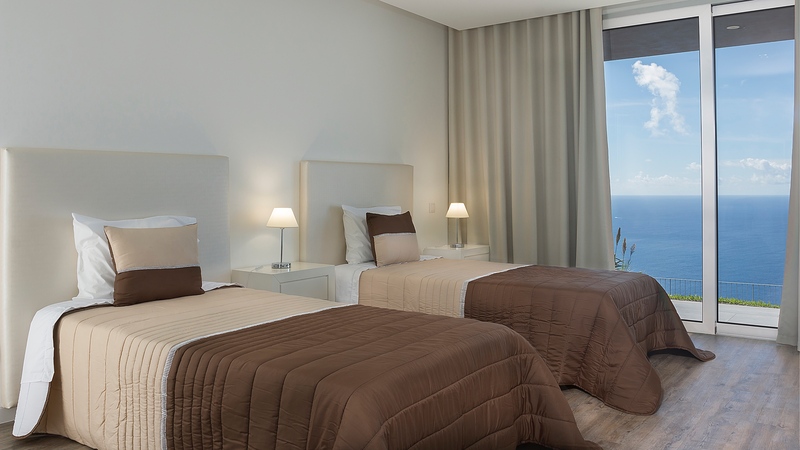 All bedrooms are air-conditioned, benefit from direct sea-views and have patio doors opening to the solarium. 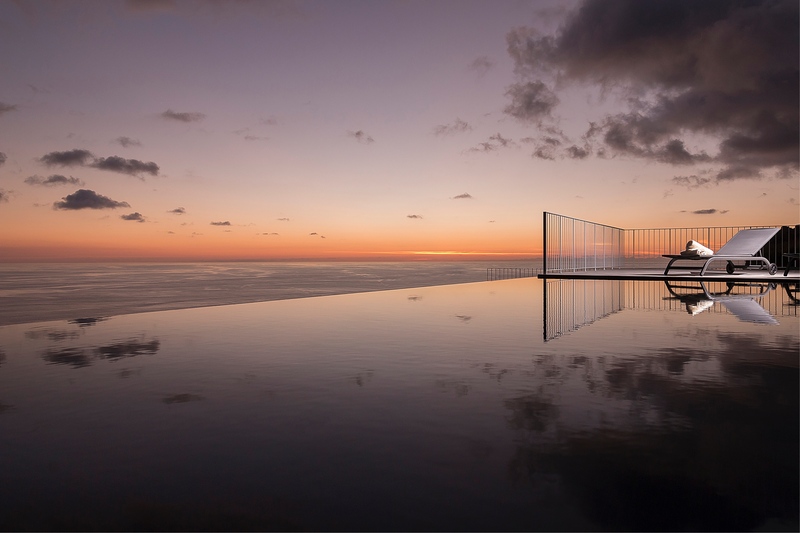 The solarium runs along the whole front of the house and features an outdoor dining table, outdoor sitting area, the large rectangular infinity pool, (optionally heated), and six sun-beds. Below this is the lawn leading down to the cliff. 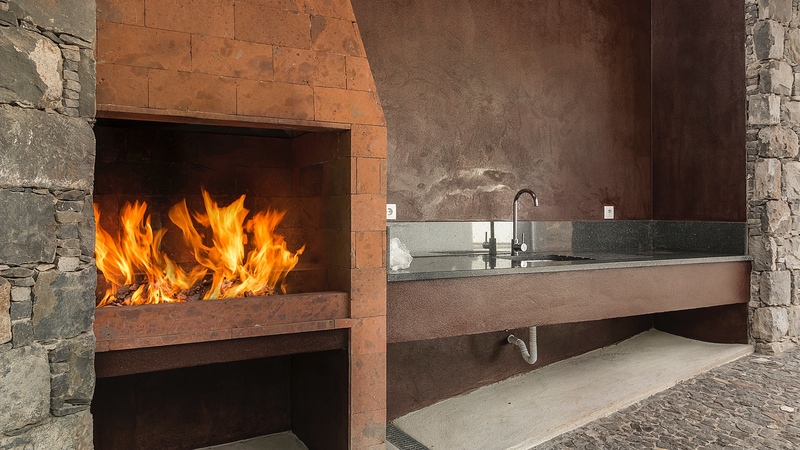 There is a large built-in wood/coal barbecue with side worktop and sink to enjoy leisure days at the villa and a ping-pong table close by. 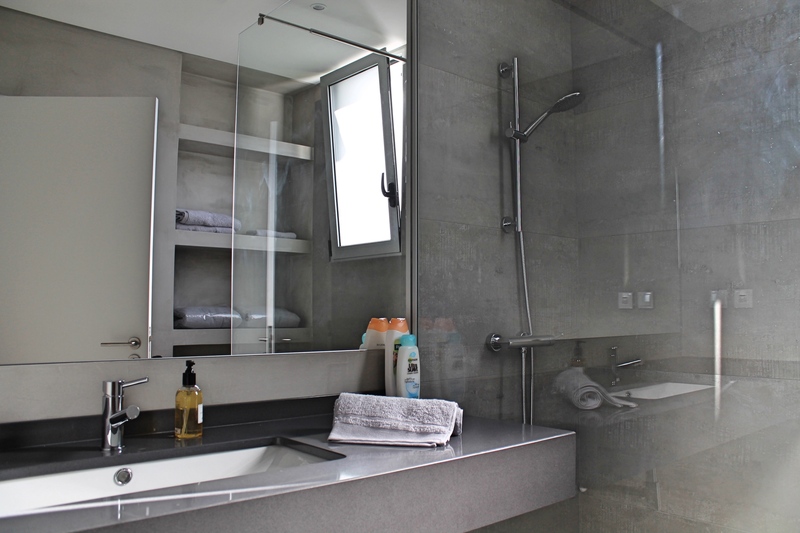 The villa features a separate laundry with washing machine, iron and ironing board and secure parking for 2 cars is available. 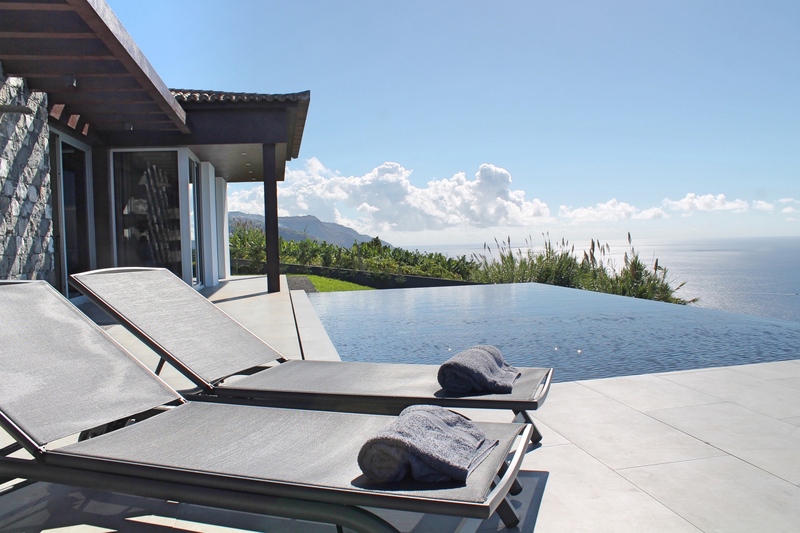 Cliffscape is a walled property that provides security and privacy, with a southern exposure ensuring those fantastic views and the sunniest weather in Madeira. 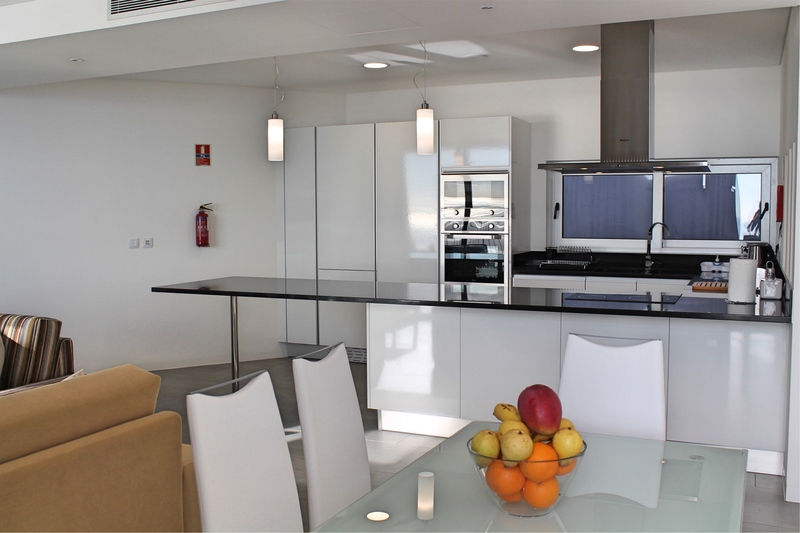 Fully equipped open-plan kitchen. 4-ring electric induction cooker, built-in electric oven and microwave, fridge/freezer, dishwasher, coffee machine, kettle, toaster, toasted sandwich maker, hand held liquidizer. Sitting area, seating for 6, with flat-screen cable TV, DVD, Bluetooth speaker. 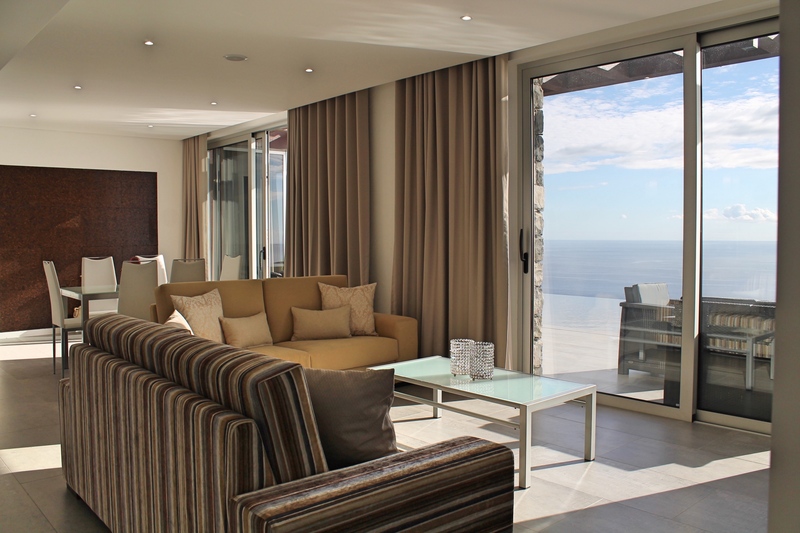 Solarium running the whole front of the house with direct panoramic sea-views. Outdoor dining table and chairs for 6 people, outdoor leisure furniture, sunbeds for 6 people. Swimming pool heating is optional and costs, 120,00€ per week for a setting of 24ºC, paid in cash on arrival. Pool heating can be provided and should be requested at least one week in advance. 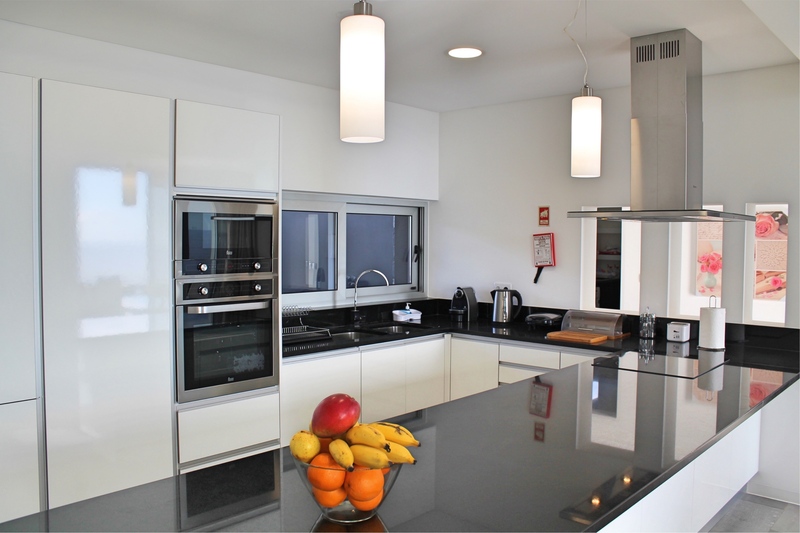 Should it be requested after arrival at the villa, the minimum charge applicable is one week, which is payable from the time the heating is turned on. Sloping lawn down to railing overlooking the cliff. There is secure parking facilities for up to 2 cars. Although not essential, as in most villas, a hire car is recommended. Open-plan kichen Fully equipped open-plan kitchen. 4-ring electric induction cooker, built-in electric oven and microwave, fridge/freezer, dishwasher, coffee machine, kettle, toaster, toasted sandwich maker, hand held liquidiser. 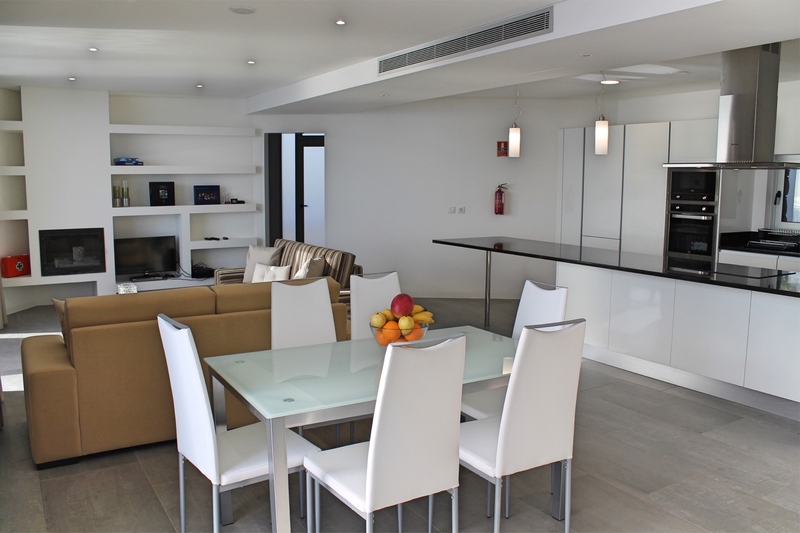 Open-plan living/dining room Sitting area, seating for 6, with flat-screen cable TV, DVD, Bluetooth speaker. Dining table for 6. 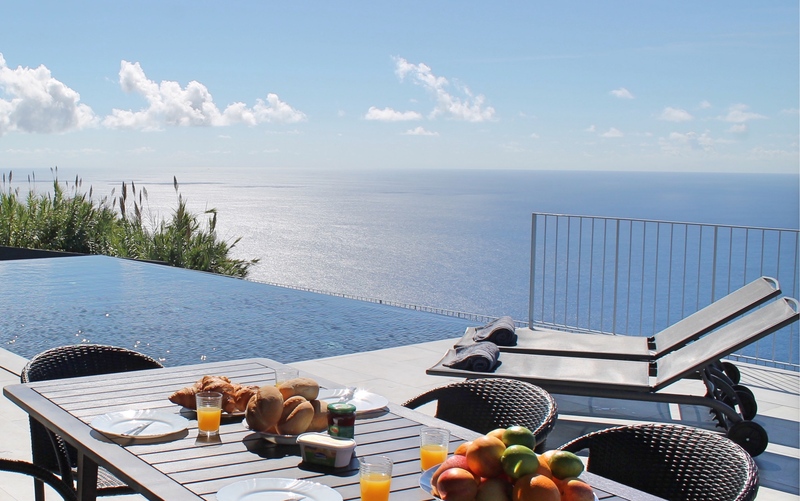 Cliffscape combines the best of all worlds: with superb panoramic sea-views and offering privacy and seclusion, surrounded by tranquil countryside, there are two small cafés/snack bars and minimarkets and a chemist only 300 metres away on foot. 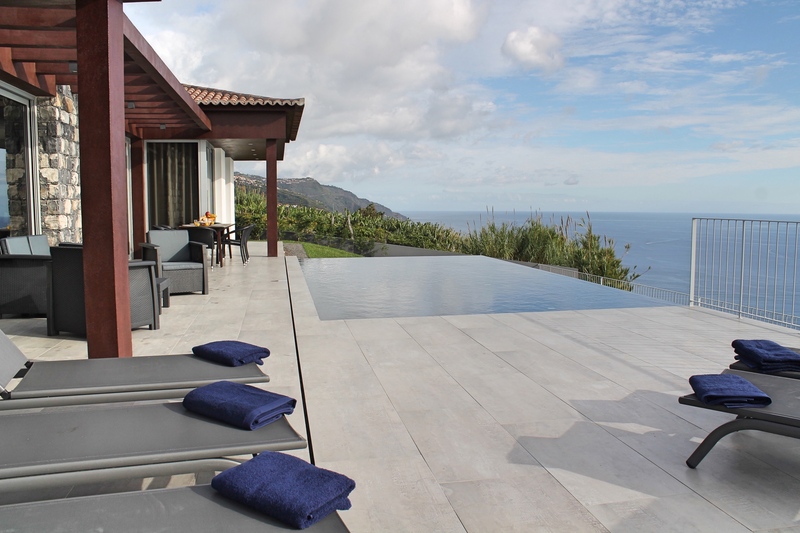 It is 3 Km to the resort town of Calheta, with its man-made golden sandy beach. Here you will, find a selection of cafés, restaurants, a larger supermarket, the marina (boat trips can be arranged), banks and a chemist. A 5-minute drive will take you to either of the two surfing meccas of Jardim do Mar and Paul do Mar, at sea level and with trendy café-bars (try the caipirinhas and mojitos). 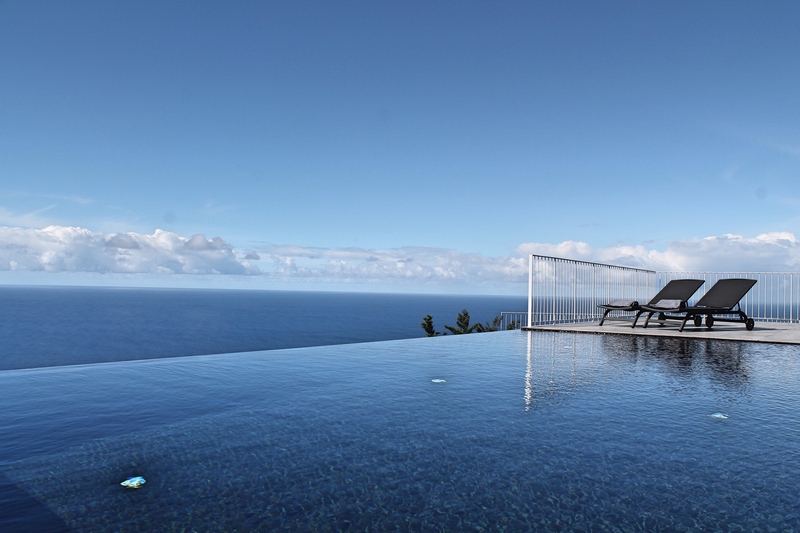 Funchal is an easy 35-minute drive and the airport less than 50 minutes along the motorway. Vielen Danke. We look forward to your next visit. Ambiente, Qualität, Raumaufteilung, Service, alles war in exzellentem Zustand. Cliffscape muß man erlebt haben. Atemberaubend ist die Terrassenseite Richtung Meer. Total unberührt, allein und maximale Ruhe ist gegeben. Wenn es uns möglich ist, werden wir ganz sicher in dieses Haus wiederkommen und gar nicht erst nach einer Alternativen sehen. Ganz herzlichen Dank an die Eigentümer, die mit bestem Geschmack dieses Haus eingerichtet haben. Vielen Dank für Ihre tollen Kommentare. Wir müssen Ihnen zustimmen, dass Sie die Terrasse erleben müssen, um zu glauben, wie wundervoll es ist. Ich hoffe, Sie wieder zu begrüßen." We were a party of four and had a wonderful week in Maderia. 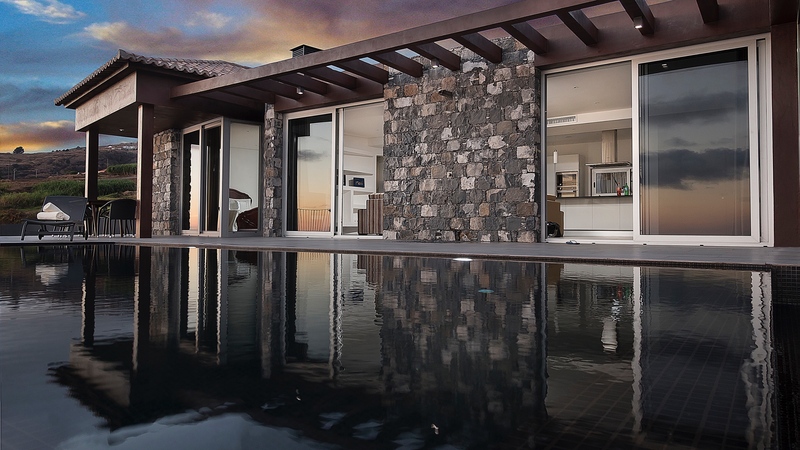 The villa is perfect. 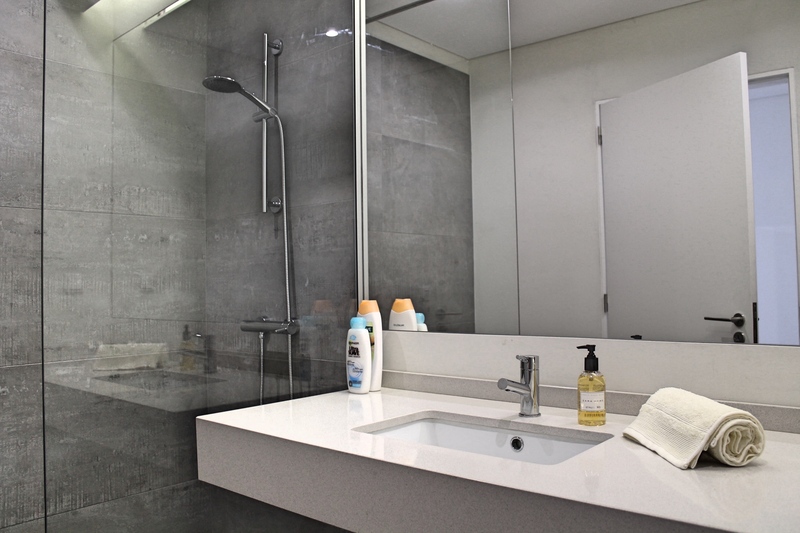 Modern and spacious and with everything you need. 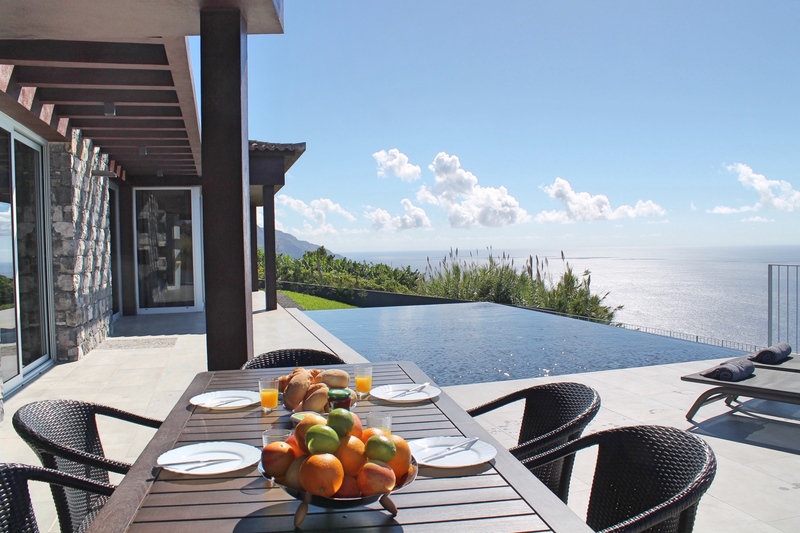 The expansive terrace and pool area had views to die for and the sunsets were spectacular. The property manager was friendly and very helpful and nothing was too much trouble. 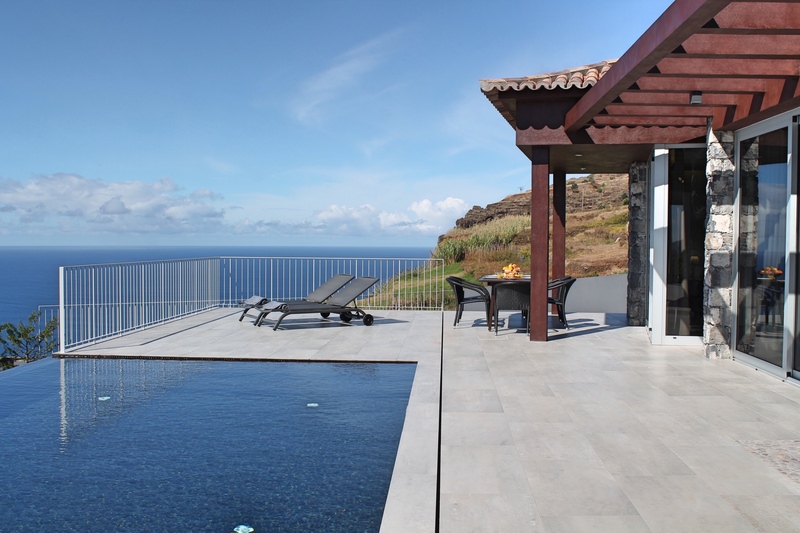 Would not hesitate to recommend this villa and location. Thank you for a wonderful stay. Thanks you for great comments and recommendations. Hope to see you again. Thank you very much for your lovely comments and review. Fabulous location and everything you need for a comfortable stay. We stayed in December/ New Year and it was quite windy. We didn't use the pool as the pool heater had teething troubles but Fernando refunded the heating charge without hesitation. Thank you very much for your 5 star review. 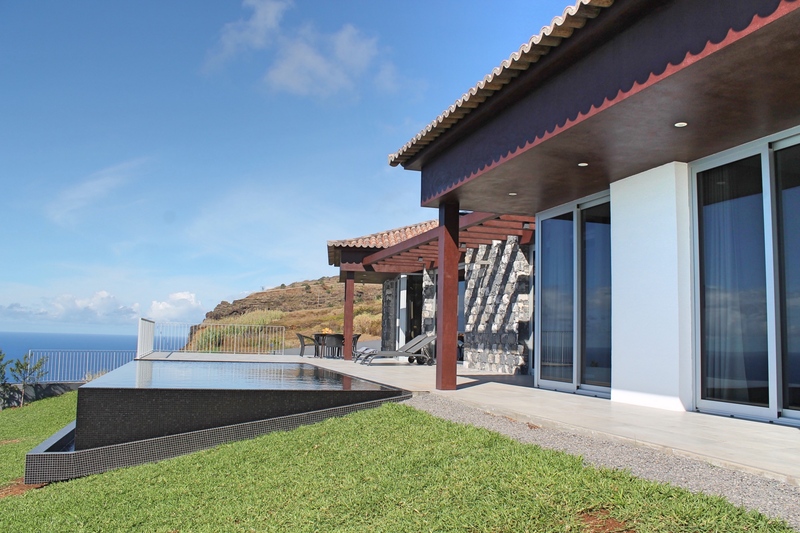 This is a stunning new villa and we are delighted that you enjoyed your stay. You must return when the weather is warmer and enjoy the pool. A really great house with a view to the end of the world ;-). The kitchen is very well equipped. Everything is new and high-quality. Very friendlly support through Delila on-site. If we come back to Madeira we will come back to Cliffscape. 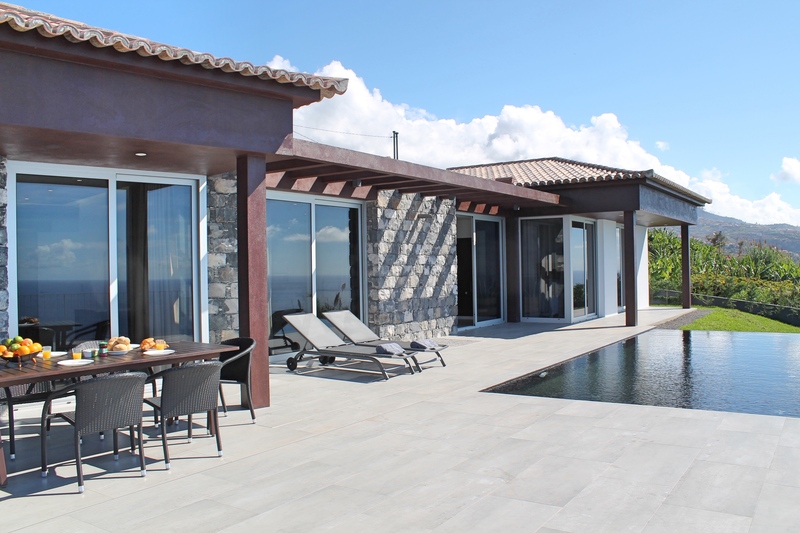 This villa is a definite 5 star rating and new to the rental market with us being the first guests to arrive. 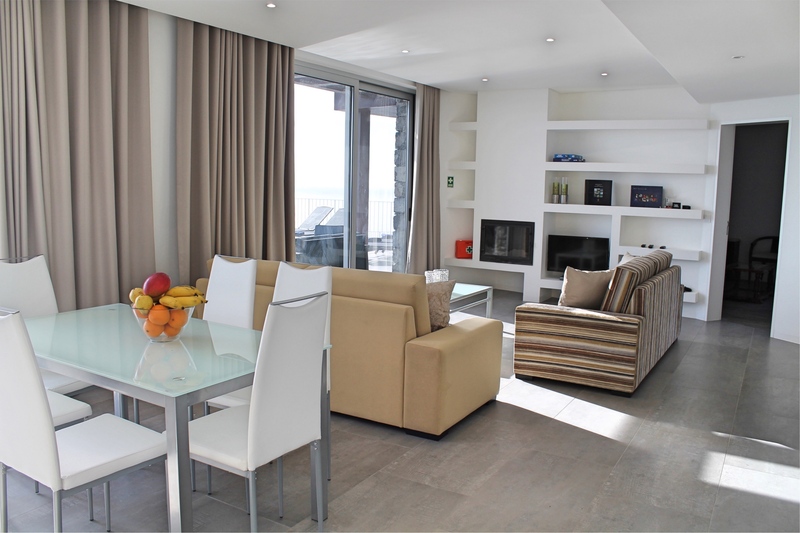 The owner has spent a fortune building this property and it is evident throughout. The location is dramatic set on the cliff giving it it's appropriate name with views to die for and no near neighbours giving total peace & tranquillity. Thank you for the privilege of being the first guests and we promise to return soon! Thank you for being our first guest, and your kind comments and recommendation is very much appreciated. We look forward to your return visit.